Alan Watson, all rights reserved. Private collection. One of the best pieces of advice I was given when a young art student was never to throw out old sketchbooks. Some visual ideas work instantly, others need time to distil in the mind, to be revisited periodically until they are ready to be expressed in full. I have found this to be true of visual and written ideas too. What a surreal image! I was hooked. How did people live there? All this struck a chord with me. 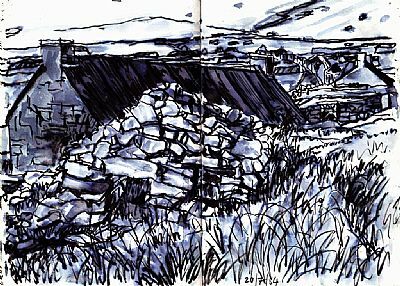 Having lived on Shetland when a small boy I found early memories of island life started to engage my imagination as I read the article. Sometime later I saw Tom Steel’s remarkable documentary about the islands called, ‘A Far Better Place’. (2) I remember being profoundly moved by the interview with Calum MacDonald, a man then in his late 60’s who had been born on St Kilda but who left in 1924. He had since lived in London for 30 years. He explained that following a recent visit to St Kilda he had been overpowered by thoughts, feelings, and emotions he had forgotten but which he now realised were hard wired in to him. This visit had clearly meant a lot to Calum, his only regret that he could not spend a year there so that he could experience in full the thoughts, feelings and memories of a now lost island culture he thought he had forgotten. I then read Tom Steel’s book, ‘The Life and Death of St Kilda’, which includes a vivid description of the evacuation of the island in 1930 followed by a detailed account of the island’s complex history. (3) From reading Tom Steel’s book I imagined an island landscape akin to the cinematic world of Jason and the Argonauts. I later discovered this thought was not far off the mark when I was lucky enough to visit St Kilda in 1979 and 1984. Approaching the St Kilda archipelago from the Sound of Harris is a spectacular exhilarating experience no matter what the weather. The fact that people eked out an existence here for thousands of years is truly astonishing. In order to survive in this isolated place the St Kildans had evolved a unique life style which relied on their skills as cragsmen to catch, kill and store thousands of seabirds so that they could pay their rent in kind to McLeod of Skye who owned the islands and to feed themselves over the long winters of total isolation. This way of life continued uninterrupted until 1697 when Martin Martin, literacy tutor to the McLeod’s visited the island. He noted that although life on St Kilda was simple and severe, it’s people seemed happier than the generality of mankind. Martin published his account of his trip in 1698, ‘A Late Voyage to St Kilda’. (4) Martin’s book caused a publishing sensation. Not only was it one of the first best-selling travel books to be published in Britain, it also described a population who lived 450 miles from London who seemed to live free from care, without money, or the need to vote or fight for king and country. Furthermore they climbed the highest cliffs in Britain to search for food long before the Victorian gentleman’s pastime of mountain climbing had been thought about. Over 250 books have been published about the islands since then. The popularity of the books unleashed a voracious appetite for tours and tourists to visit St Kilda and view the strange inhabitants. Because of their isolation the islanders had little resistance to common disease’s visitors unwittingly brought with them. In many ways the St Kildans suffered the same fate as indigenous tribes in the Amazon rainforest suffer today. 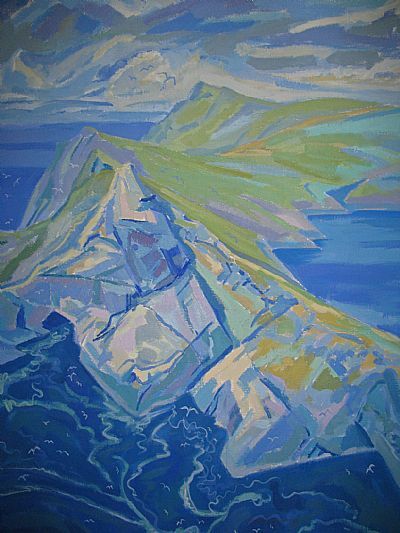 As a painter I was passionately interested in the close relationship the St Kildans had with the natural world around them. For anyone who is keen to research the islands history there are collections of Victorian photographs of the islanders at work which can be viewed in many locations. What struck me on visiting St Kilda and being familiar with the photographs is how easy it is to stand in the same spot where the original photograph was taken so long ago and evoke memories. St Kilda is full of ghosts, an islander standing smoking a pipe beside the doorway over there with the splash of tar still on the lintel, or flying through the air gazing down on me through the unblinking eye of an inquisitive fulmar. The paintings and drawings I created which were based on the life of the St Kildans tried to recreate, to capture a sense of the exhilaration of catching fulmars, gannets or puffins in an extreme environment and also my response to the sadness and melancholy of a small isolated, yet dignified community, which was inevitably doomed to fail while being scrutinised under the relentless gaze of our sophisticated society eager to find a utopian society which we can ultimately never achieve. The following 2 paintings from my St Kilda series can be viewed at BBC 'Your Paintings' website. When a St Kildan died the St Kildans referred to them as having ‘Gone over the Rocks’. In truth very few of those highly skilled cragsmen ever died in climbing accidents. My large colourful painting shows two young islanders who did die in a climbing accident not long before the evacuation of St Kilda in 1930. They were apparently in a rush to get back to the village to greet the mail boat and any welcome post it may have had for them. In their haste to finish their task on the cliff face they both slipped and fell to their death. The two St Kildan’s are depicted here flying above the village bay with the Hirta village below them, in the the safe care of a St Kilda Bird Spirit who is now watching over them. The detail of the northern section of the island stretching from the cliffs of Mullach Bi to Soay and the Combir at its northern end extends to the top of the picture. I intended this not as an image of death but of reincarnation. People of the Western Isles had a common belief that they would be reincarnated as a sea bird after death. What an exhilarating way to think about the afterlife. 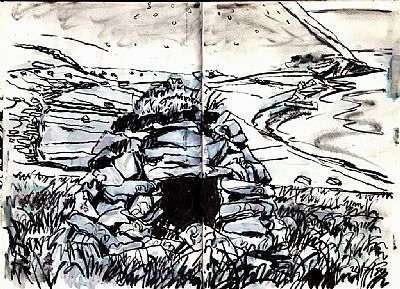 During my first visit to St Kilda in 1979 I spent an exhilarating mid summers evening at the summit of Mullach Bi. At 1164 feet, the highest point on the Western coast of Hirta. The summit sits at the top of a large amphitheatre shaped cliff face which drops steeply to the sea below. In the still grey light of the simmer dim I could hear the eerie cries of grey seals calling from below. It seemed to me their plaintiff cries echoed across each other sending shivers down my spine so that after 30 minutes I felt quite terrified by the sound I was hearing. This painting of a St Kildan with a catch of gannets round his neck has been painted with a strongly contrasting colour palette in an attempt to convey dramatic sound unseen to the listening ear and the fear it can invoke. (1) The article was in one of many copies of 'The Scots Magazine' I read while on holiday at Carradale, Mull of Kintyre, 1973. (2) Steel, T., 'A Far Better Place', Thames Television, 1972. (3) Steel, T., 'The Life and Death of St Kilda', Edinburgh, 1965. (4) Martin M., 'A Late Voyage to St Kilda', London, 1698.